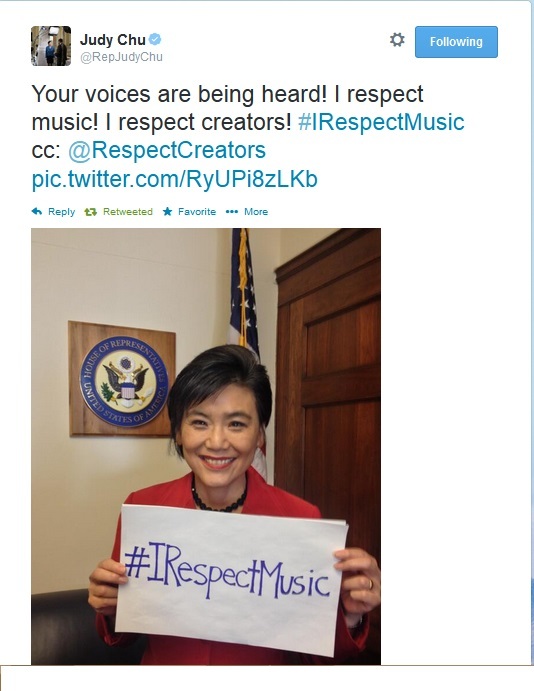 Home > #irespectmusic campaign	> Thank you, Representative Judy Chu! Thank you, Representative Judy Chu! Representative Judy Chu, a strong leadership voice for creators in the U.S. Congress and co-chair of the Creative Rights Caucus (@respectcreators) posted her #irespectmusic selfie on Twitter! Follow Rep. Chu @repjudychu and the Creative Rights Caucus! Privacy Rights, Property Rights and Google Pandora and Sirius Side by Side And Does Sirius Mislead Consumers?